As we age the need for more and better lighting becomes more necessary. But for those with eye diseases like age related macular degeneration (AMD) improved lighting is essential. One of the most common symptoms of AMD is the need for more light such as a higher wattage bulb or light that is directed onto one's reading. The other common AMD symptom is difficulty seeing detail. Words or images often appear blurred. Sometimes that means new prescription glasses may be needed, but often times improved vision can be achieved simply through better lighting. You may need to add more lights in the house for general lighting - such as floor lamps, overhead canned lights, torchiere lights, etc. or you may need lamps especially for performing tasks or hobbies. During one of our visits to my in-laws home, I noticed that the desk where my father-in-law does his paperwork and goes through his mail, there sat a decorative table lamp. He has wet AMD and has difficulty seeing and paying his bills. The table lamp provided general lighting but not direct light. Often the first impulse is to use a magnifier or get a stronger magnifier and that of course may be needed. But first assess the lighting. 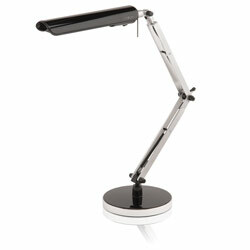 A swing arm desk lamp with an LED or halogen bulb that can be moved and directed onto the reading material may be all that is needed to see clearly.